It’s a new year and for many of us, it means revving up our weight loss goals. If you’re looking for some fat-burning magic to supplement a healthy diet and exercise regime, Slimvance and Hydroxycut may be just what you’re looking for. Let’s review the science behind both to see how and if these products actually work. Slimvance, have you herb about it? The Slimvance Core Slimming Complex is a new, patented, weight-loss breakthrough by Bodydynamix™. Sold exclusively at GNC, Slimvance Thermogenic and Slimvance Stimulant-free formulas consist primarily of three well-known wellness herbs—moringa, curry leaves, and turmeric—selected after years of clinical research for their potential to help maximize weight-loss results. The plan is pretty straightforward: eat a healthy diet with moderate calorie intake, exercise regularly, and take two capsules twice a day (once in the morning and again 30-60 minutes before exercise). Seems very doable! A 14-day clinical study showed that when taken in conjunction with an 1,800-calorie diet and walking plan, Slimvance resulted in six times more weight loss and three times the hip and waist reduction compared to an 1,800-calorie diet and walking alone. 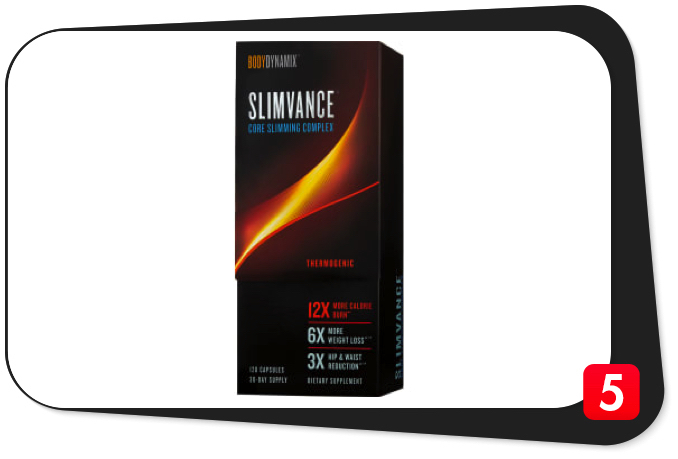 Slimvance Thermogenic and Stimulant Free both supply the patented Core Slimming Complex herbal blend. This 450 mg blend features moringa oleifera leaf extract (moringa), Murraya koenigii leaf extract (curry leaf), and Curcuma longa root extract (turmeric)—all of which trigger the body’s natural ability to lose weight, per contemporary research. If you’re wondering what the heck moringa is or how curry and tumeric—the seasoning in your ethnic food—can aid in weight loss, here’s some clarity. Moringa trees, native to subtropical areas, grow leaves which have served as health remedies for thousands of years. Historically, consumers have been using turmeric as a digestive aid, but it may also help fight infections and some cancers. It contains curcumin which exhibits anti-obesity effects and is a powerful antioxidant and anti-inflammatory [3. Meydani M, Hasan ST. Dietary Polyphenols and Obesity. Nutrients 2010, 2(7), 737-751.]. Core Slimming Complex Thermogenic – A 450 mg combination of Slimvance herbal blend with caffeine, cayenne, Garcinia cambogia, and other fat loss nutrients for a more intense formula. The brand touts that unlike many of the competitors, the stimulant-free Slimvance does not contain caffeine. This is a big selling point for those who are sensitive to stimulants or are trying to curb their caffeine intake. Most other stimulant-driven fat burners have a label warning for possible side effects. However, Slimvance only has a very basic and brief warning that states, “Food allergies to Turmeric, Moringa, and Curry Leaves are rare”. Does that mean there are no side effects? It’s hard to say. If you don’t consume stimulants on a regular basis and are taking Slimvance Thermogenic, then 200 mg of caffeine may bring typical caffeine side effects such as nervousness, tremors and jitters. However, Slimvance seems well-tolerated among customers, with little risk of side effects. When manufacturers do actual human clinical trials on the products, as in this case, it is easier to make that claim – because you can actually demonstrate safety and tolerability. In one randomized clinical research study of 140 overweight adults, the subjects took Slimvance Core Slimming Complex in combination with a 1,800-calorie daily diet and walking program. In comparison to the placebo group, subjects taking Slimvance experienced significant fat loss results that on average, kicked in around week 2 of the 16-week study. So, based on these results, does Slimvance seem to be an effective weight-loss aid? I’d say yes. These are pretty significant results for a 16-week study, especially when measuring overall pounds lost. Imagine how different you would feel losing 12 pounds in just four months. It’s important to note that according to various press releases, experts have tested Slimvance in two human clinical trials however, the actual study papers are not yet available online. When you think of diet pills, the name Hydroxycut may be top of mind. The brand has been around for over a decade, eliciting images of ripped, tanned people and intense sounding product names. Hydroxycut is on the shelves at many popular stores and is America’s No. 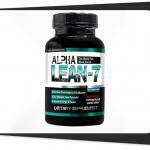 1-selling weight-loss supplement, offering a family of products designed “to fit your lifestyle”. Hydroxycut offers supplements for both “weight loss” as well as “extensive weight loss”, including: caplets & capsules, drink packets, drops, and gummies. The brand also offers the Real Results Transformation Program, which through their free Hydroxycut app provides users with diet and exercise plans to help them stay on track. The key weight loss driver in Hydroxycut is green coffee extract (C. Canephora robusta), which, according to the National Institute of Health, may have modest effect on body weight. Green coffee beans have higher levels of chlorogenic acid than roasted beans. Green coffee extract, probably because of its chlorogenic acid content, inhibits fat accumulation. According to the Hydroxycut website, subjects taking C. canephora robusta for 60 days lost an average of 10.95 lbs. versus the placebo group, which lost an average of 5.40 lbs. Both groups followed a low-calorie diet. In a separate eight-week study, subjects taking C. canephora robusta lost an average of 3.7 lbs. versus the placebo group, which lost 1.25 lbs. 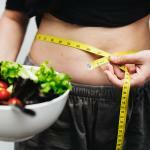 Both groups followed a calorie-reduced diet and performed moderate exercise. It’s important to note the published paper Hydroxycut continually references is a study on Svetol®, a decaffeinated green coffee extract, and not any Hydroxycut product. Despite its vast range of products, the manufacturer references the same study each time. This means the ingredients that set the supplements apart have not really been verified. The key ingredient, green coffee extract, has some sound evidence supporting it’s weight loss potential. 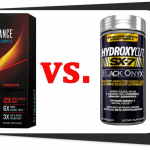 However, the Hydroxycut product line as a whole has some claims that research hasn’t backed up. Furthermore, researchers have reported serious side effects on this supplement over the years. Hydroxycut certainly is popular, easy to get your hands on, and is also, for the most part, affordable. So if you are someone not reading too deeply into efficacy claims and someone not really concerned with side effects, Hydroxycut may be a good option for you. 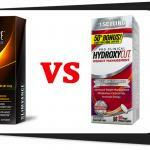 Like any comparison, there are a number of pros and cons to both Slimvance and Hydroxycut. 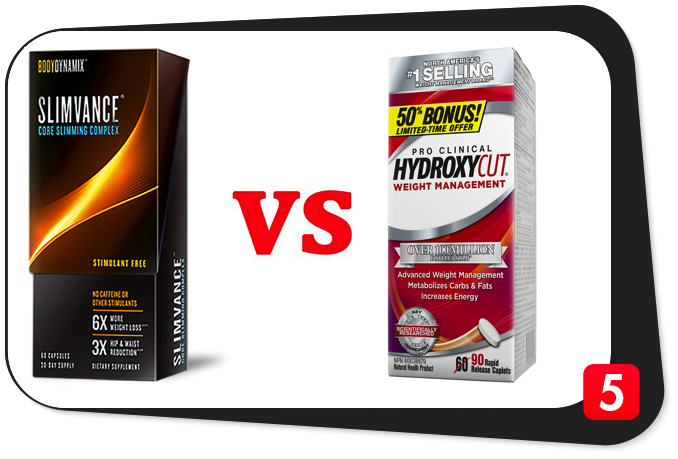 However, it’s much easier to jump on the Slimvance wagon as an effective weight loss supplement than Hydroxycut. The Slimvance human study, although sparking a bit of skepticism because it’s not online, resulted in very positive results with little to no side effects. The three ingredients in the Slimvance herbal blend also have sound research proving their positive effects on health. The streamlined dual-product line by Slimvance is, in our opinion, more easy to digest than all the crazy-sounding Hydroxycut products. It’s nice how there are only two Slimvance options, one with stimulants and one without. Although the key ingredient in Hydroxycut helps you lose weight, it’s hard to ignore all the intense side effects reported on the supplement over the years. But to play devil’s advocate, Hydroxycut has been in the market much longer than Slimvance, so perhaps we need to wait and see if any serious side effects will be reported with the latter. For now, if I were looking for a quick pill to rev up my weight loss goals, I would go with Slimvance.